Here, we chat to Simon Erlanger, Managing Director of Harris Distillery. It would have to be an Isle of Harris Gin Martini, stirred not shaken, served very cold, very dry and with a twist. We've been exploring the story of this classic cocktail throughout the year, and working with some great bartenders across Scotland to create unique recipes using our island spirit. I highly recommend the Martini project section of our website for inspiration! Either try them at home or better still enjoy them in style in the bars where they were created. What does Christmas at Harris Distillery look like? We've been working with some incredibly talented chefs as part of our new Seafood Project, but I'll have to admit a soft spot for Nigella Lawson this year. 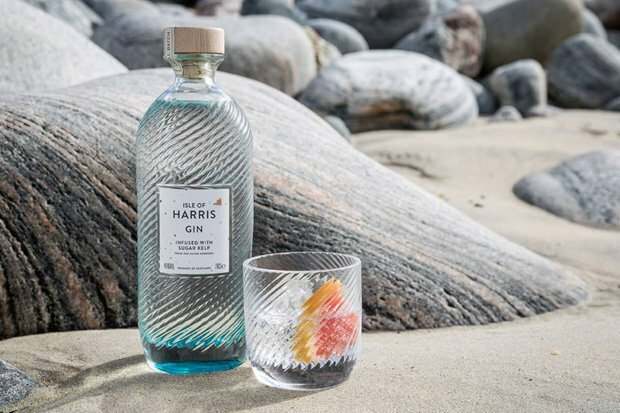 She was kind enough to share a photograph of her bottle of Isle of Harris Gin with her million plus Instagram followers earlier in 2018, describing it as the most delicious gin she had ever tasted. So, there may be a few Nigella Christmas cookbooks stuffing our stockings this year to show our mutual appreciation. We love Scottish shellfish so, if you're making prawn cocktails or crab terrine, grilling langoustines or lobster, or simply shucking some oyster shells, I'd recommend getting hold of a bottle of our Sugar Kelp Aromatic Water. Just add a few drops to your final dish to bring an extra hint of Outer Hebridean seas. It has a sweet-salt, umami flavour which can bring an intriguing new dimension to your seafood dish. Or simply add to your gin or a dram of whisky to enhance the coastal maritime notes. I never would! In 30 years the Erlangers have not left home once for Christmas dinner and we would have a family mutiny at the very suggestion. I'm the annoying one who eats it one day at a time and then gloats when I still have chocolate left when others have empty windows in their calendar. My wife and I both grew up with home-made mince pies in the house, so they remain essential as far as we are concerned. We are currently using a 2016 vintage mincemeat, which was a particularly fine year! No shop-bought one will ever come close. I am responsible for Christmas dinner and immodestly would say I have perfected the traditional turkey, which benefits from 8 hours slow roasting in the Aga. When the boys were younger and less able to wait, this entailed a 5am start, but today simply allows the day to go at a leisurely pace. Christmas is coming and, like many close-knit communities, we're looking forward to celebrating the coming season in great company. We’re also lucky to have plenty of Isle of Harris spirit to share, not just with local friends and family but with the wider world too. So, with a just a few weeks to go until Santa Claus (or Bodach Na Nollaig in Gaelic) comes calling, we invite you to join us in giving a little Outer Hebridean festive cheer this year.